Sometimes a person wonders why nonsense movies like “The Hurricane Heist” are being made. It’s a mixture of “American Heist” with “Into the Storm“. Actually, this disaster film (all aspects of this movie are kind of a disaster by the way) looks like “Den of Thieves“. Here too a gang of criminals get the bright idea of ​​stealing money which is doomed to go through the paper shredder. Money that’s about to be taken out of circulation and so no longer will exist. Only the savvy bank robbers hoped that the authorities would think that the stolen money (squeezed in three whoppers of trucks) disappeared because of an onrushing hurricane (category 5). The amount of money they want to steal is around $ 600 million. The makers had better raised their budget with a few million too, so they could improve the rattling script, a few failing actors and the lousy special effects. At some level it really was a disaster. Watch out Dad. There’s a huge thing coming … euh … too late. So, you won’t be blown away by “The Hurricane Heist“. However, the beginning was very promising. A flashback in which the young Will and Breeze try to escape from another impressive hurricane, together with their father. An ill-considered and stupid decision makes that the boys have to watch with dismay how their father is being steamrolled by a flying silo. Trust me. There are more stupidities to admire in this film. This disastrous event affects the lives of both boys to some extent. Will (Toby “Kong / Koba” Kebbell) becomes an experienced and expert meteorologist (although he’s more of a storm chaser). After all these years he still tries to find the cause of these weather phenomena. And of course a solution to prevent them. Probably a sort of Freudian reaction to save his father after all these years. Breeze (Ryan Kwanten) is completely the opposite. A fatalistic nobody with a “je mon fou” attitude. Probably he tries to forget the event in this way. Lets hack a paper shredder ! Will should have checked with the robbers. Apparently they were initiates in the secrets of the origin of hurricanes. You have to be a Nobel Prize winner to know weeks beforehand that in the vicinity of a U.S. Treasury facility a hurricane of category 5 will show up. And they could determine exactly that the eye of the hurricane would cross that place. The timing was crucial. Otherwise they wouldn’t know when to hack the paper shredder (ever heard of a paper shredder connected to the internet?) and disable them so that the money would pile up. What follows is a “Die Hard”-like rescue operation with the meteorologist Will playing the role of knight in shining armor who’s willing to help the lovely, female security guard Casey (Maggie “Aftermath” Grace) in derailing this inventive, malicious plan. Now this is what you call a biased hurricane. The gang is led by the self-assured Perkins (Ralph Ineson). The most humane bank robber I’ve ever seen in a movie. This villain doesn’t want the robbery to become a bloodbath. So everyone is neutralized with a sedative they probably use for elephants I guess. He also has an exceptionally deep voice. I’m sure the singer of The Crash Test Dummies would be jealous. What this gang has not taken into account is the fact that hurricane Tammy has a sense of justice. It always acts in favour of the honest trio. The bank robbers fall prey to the rough elements of nature and they have to hold on to anything they can grab. While cars are blown away like feathers by Tammy, you see our heroes calmly standing with still a perfect looking hairstyle. The hubcaps Will uses as a projectile, won’t hit him in the face, but are accurately flying around the corner by use of the powerful hurricane. And wait for the scene in a mall where the roof is torn off and our heroes are catapulted into the air while hanging on a cable. And next you’ll see them descending as angels on a rope. No need to say it doesn’t end well for the bad guys. In other words, it looks ridiculous sometimes. The demonic skull in the sky was hilarious. “Hurricane heist” may be about a category 5 hurricane. The film itself is no more than a weak low pressure area. Perhaps it all looks action packed and swirling (how appropriate). And perhaps it’s a film where exceeding the limit of credibility is allowed. But this was a bit exaggerated. To be honest, already from the beginning I had a feeling this movie might be a disaster. The moment a skull appeared in the black storm clouds (something similar as in “The Mummy“), I was sure of it. 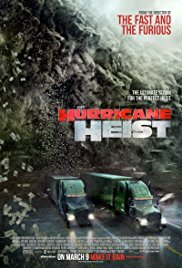 Indeed, “Hurricane Heist” is about a robbery during a hurricane. But it sure isn’t “The perfect hurricane heist“.